Welcome to the November edition of What’s New in AdStage! We’ve had a busy month and wanted to share the latest changes. We’ve added more flexible filtering options by adding OR as well as AND functions. Now drill down on campaigns that contain “US” OR “UK” AND “Display”. Looking to include Folder Name? Simply add it as a column to quickly see which campaign is in what folder. Are you a big Google Data Studio, API, or Google Sheets user? Now we make it easier to find your different Entity ID Strings. Simply add AdStage Entity ID to grab the ID for Accounts and Campaigns. Looking for Folders? Add Folder ID as a column. 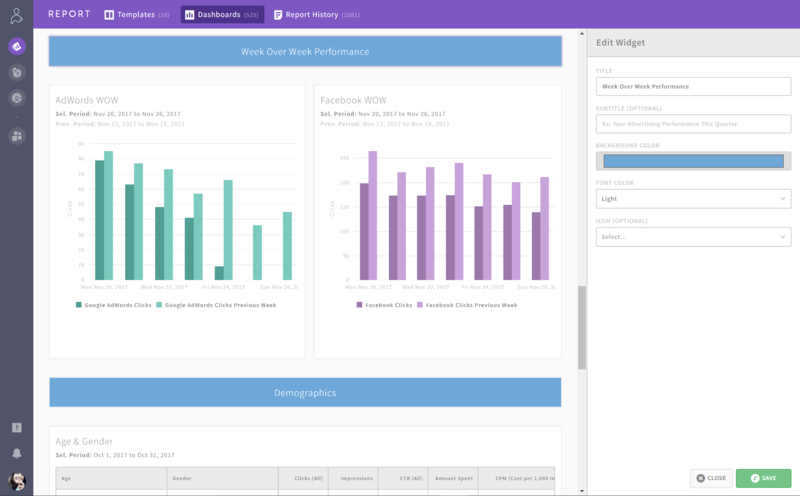 In just a few weeks we'll be unveiling Section Header Widgets in Report. Add Section Headers to create natural divides between network performance data, web analytics, and widget types. Section Headers add color variety and create a more visually appealing Report. Interested in trying out the beta? Reach out to us at support@adstage.io and we'll gladly unlock it for you.